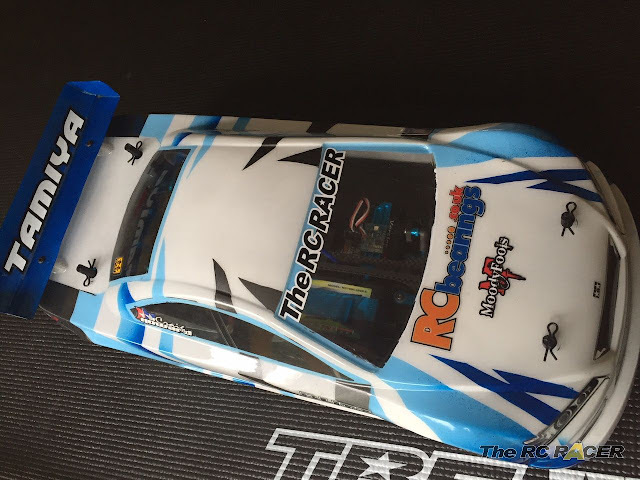 Since the review of the TRF419 I have raced the car almost every week. So I thought I would do an update on my findings on the car, and list my current set-up. Over the last 8 months I have mainly raced on carpet, and at smallish club venues. I've ran a selection of classes including 17.5 blinky, 13.5 boosted and 13.5 blinky. My local club is indoors with large wooden boards to help define the track. The level of racing is good, and in my top heat a single crash can move you from hero to zero, so obviously an incident where a part fails really is a nightmare. The 419 has proved it's very robust in this respect. Tamiya along with Xray have always been brands that I have favoured due to their build quality and strength, the 419 like the 418 is really good in this respect, and despite some very large collisions with the boards the car has suffered only minor breakages. The common part that has broken is the new design C-Hub. In a similar period of time with my 418 I had broken one or two c-hubs and that was it. With the 419 I have broken 6 C-hubs. The new design is meant to be better for the double cardan drive shafts, with less chance of them rubbing but I never really had much of an issue with the 418 parts doing this. Recently though I seem to have avoided any of these parts breaking, maybe the newer batches are slightly different? or I could just have been lucky. There are some alternatives though, you can just go back to the 418 parts, these are good, and they also have very little slop. The other option is to use the square TB04 aluminium parts. These are very well made, but they do have a 5 degree caster angle so you will need to account for this in your set-up. Other than the C-hubs no other part has failed. The front spool outdrives have been replaced as they had started to wear (These are a consumable, and you will always expect to replace them), they also caused a little wear on the drive shaft pins so I replaced the drive shaft part of the cardans (They are available separately and much cheaper than a full set of drive shafts). I have gone back to the TRF418 spool out-drives that require the drive shaft cushions. I just think the car feels better with these, I know it makes no sense, but maybe the little give of the plastic just softens the spool on acceleration. Although If I was racing Mod I might have to go back to the metal against metal solution as it would be tougher. Like the 418 the car is also pretty much tweak free. I have tested it to the extreme on some occasions and when I plop the car down afterwards on my set-up station I find that the car is still straight and true. The new diff is also very nice, but it can leak a little around the out-drives. I have used the red o-rings and larger shims and didn't notice any leaks and my diffs were fine when I would change the oil in them. However using the X-Ray o-ring and slightly thinner shims (0.2mm instead of 0.3mm) is recommended to ensure that your diff is totally leak free. (Thanks to THard for discovering that). The plastics on the car have been great, no slop has appeared on the car that was not there since day one, that is great as it ensures that my set-ups stay pretty much accurate, even if I have had a busy week and not been able to check over my car. So from a durability point of view, I cant really fault the car. What would I like to see revised in the next version? I would love to see a revised C-hub that is both stronger and also has much less slop around the flange bearings. 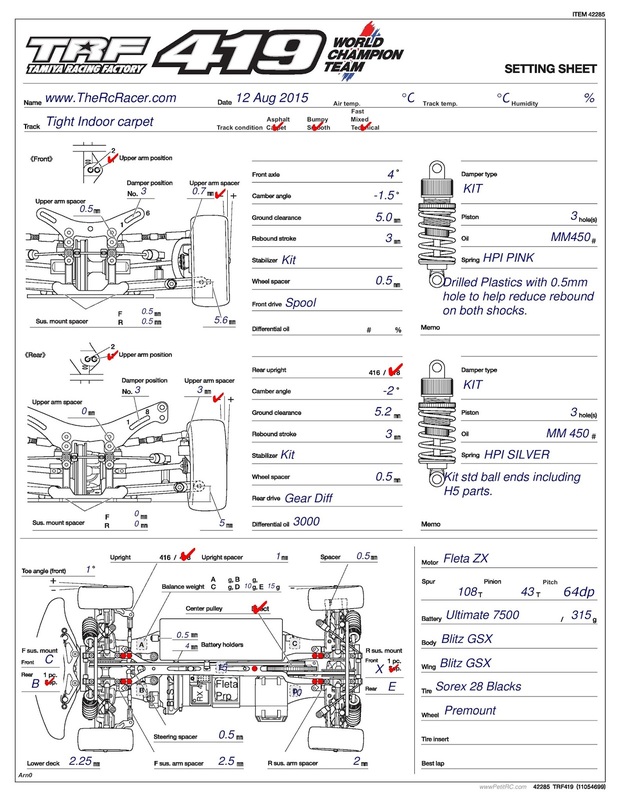 This only needs to be a revised part, and it is the common part that all TRF419 owners think needs fixing for the next version. Also a better o-ring and shim set for the differential, a small change but one that will be appreciated by the majority of racers. The only things I have changed on the car are the 42295 stabilizer stoppers and the 54647 servo mount plates. The servo mount plate stops the servo moving on large impacts (Although mine has never moved, but better to be safe than sorry). The stabiliser stopper just makes it easier to set-up the roll bars, again no performance but it does help to speed things up when setting the roll bars. This car is quick, it was a step up from the 418, but nowhere near the leap between the 418 and TRF417v5. This car has more tuning options thanks to the motor mount. 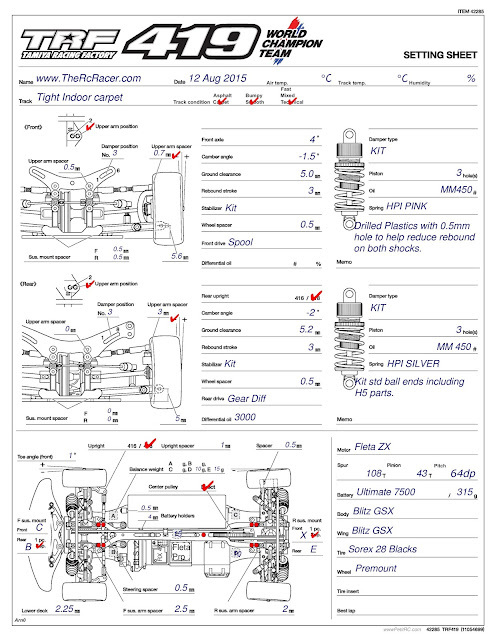 There are a lot of screw positions that you can adopt to change the flex characteristics of the car. The most common layout for me is to have the top deck screw in the car, and one screw in the lower front section of the motor mount, and two in the rear section. This increased the rear grip a little but still gives me a rear end that I can swing out for some of the tight in-field sections of my local club track. The 419 also leans more on the corners than the 418, so I have gone back to using the HPI springs instead of the Yokomo versions. I use Pink on the front and silver on the rear. 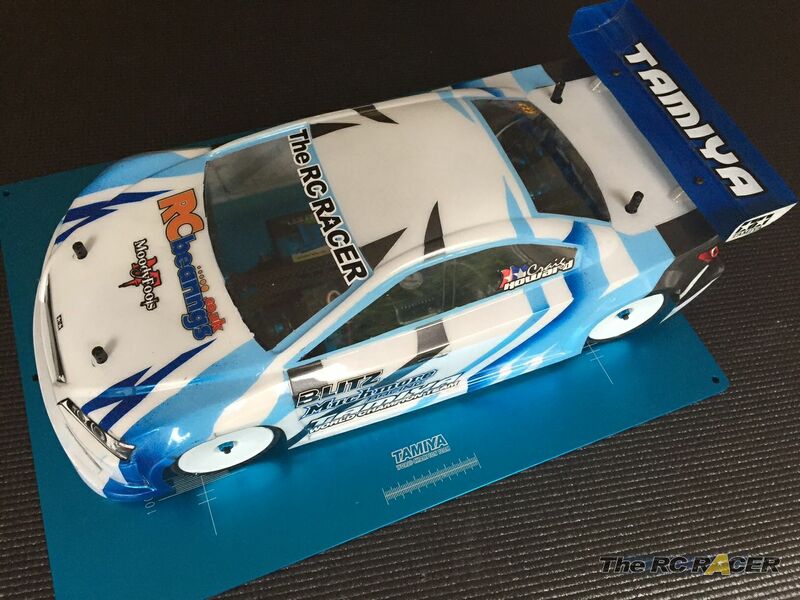 Whilst they have a similar strength to the Yokomo springs they are more linear and that extra stiffness over the first 2mm or so makes the car feel more snappy and it improved my lap time. The other thing that I have tried is thicker roll bars front and rear, this is also to reduce the roll off the car, I haven't spent enough time yet testing this and refining a set-up but I intend to test this more. I have also played with is the roll centres. The 418 seemed to be really sensitive to changing the roll centre shims and the 419 carries on this trait. I have tried a few different set-ups and currently I run 0.5mm on the front inner and 0.7 on the front outer hub and the car feels really good. I do sometimes swap the outer shim to 1mm to raise the roll centre. Note: The new C-hubs also allow you to easily change the outer front height as well if you want more dramatic changes. Other things I played around with was the track width (with the new 0.75mm wheel spacers) Again smaller adjustments around the base settings seemed to be the best for me. The steering of the car is good, I have played with running front arm sweep on the 419, mainly to try to improve corner speed further, but since I have moved to the HPI springs and the stiffer roll bars I actually am starting to prefer the car without this setting as it can sometimes hook too much on the apex if you are not paying attention. This is ultimately a faster car with this setting, but after a long day at work and racing my car at the local club my concentration is not always 100% so taking it off makes it easier to drive with only a small reduction of ultimate pace. Other notable changes are the shorter wheelbase, this seems standard on many of the set-ups, this again gives you more rotation. Also I have again used my X-Ray 18mm servo saver as I want the full range of steering throw available to me, although I use only 60% on my current transmitter setting. I race regularly but my club night is quite hectic so I do not get a lot of time to just tune the car. This is where the excellent RC Crew chief really comes into it's own. You can change a variety of settings and compare the data of what they will do when you are on the track. The software is excellent and now it even has steering ackermann information. Apart from re-factored C-hubs and better diff shims and O-rings, I would be interested to see if the car can have even better left and right flex options. It would be interesting to see if a raised lipo holder that lifts the whole battery could free up the chassis to flex more easily. I am also keen to have the chassis cut-outs symmetrical on the lower plate. At the moment the front and rear diff cut outs are not equal and this seems a little counter intuitive to me. Carrying on with the flex options, I would be interested to see what can be achieved with the motor mount, maybe adding more options to the flex and also moving the motor back towards the centre like the TRF418 to help reduce the roll. 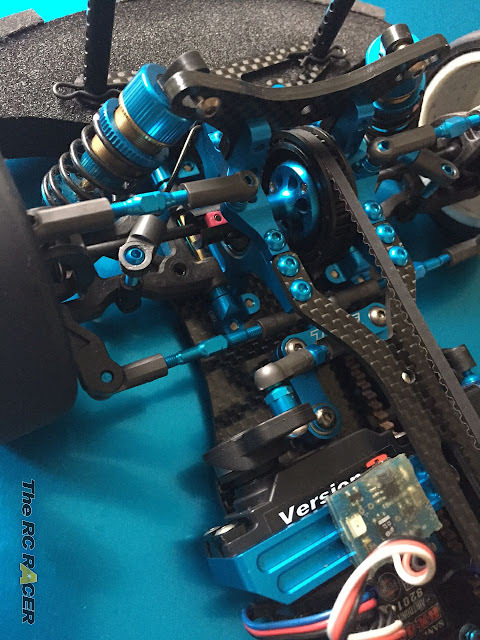 Another small but simple thing is to change the lower steering rods should be like the TB Evo6 versions. These would be much easier to fit and change as you can actually grip them. Racing is great fun, but it can be demanding, especially when you are trying your best to get head of the other great drivers at your club. I think it is testament to the TRF419 that I have not had any issues with the car when trying to achieve this. I have only suffered a small amount of breakages and even then the car was still drivable. (The C-Hubs crack open, but do not seem to come apart, making that section of the car more spongy but still drivable). The Blitz GSF has been a great shell very stable. 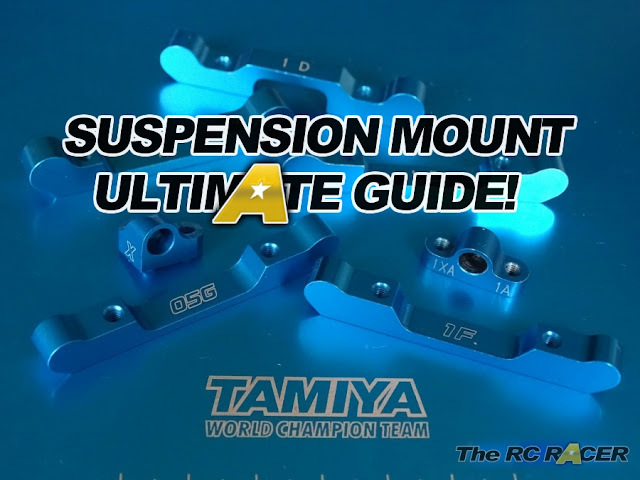 The high quality parts have also ensured that once I have a set-up I like, I can confidently pop the car on the track, week in and week out knowing that the car will not surprise me with errant handling. Importantly the car has helped me maintain the winning ways that the TRF418 helped me achieve. This has lead to other guys at the club taking notice and the TRF cars are becoming even more popular with other racers. Who knows what the new 2016 version of the car will be? 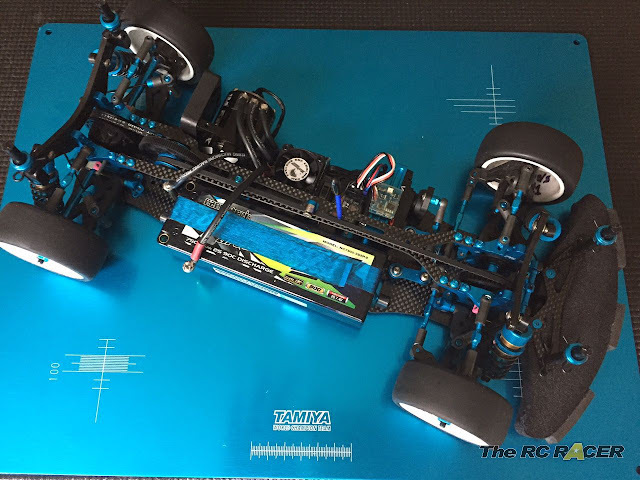 At this level cars are all about evolution, but at the moment I do not have any need to upgrade to a new car thanks to the results and satisfaction I get from racing the TRF419. What sort of things would you want to see on a new TRF?